Onannon is a project for Kasper, Sam and Will they are three young winemakers with deep roots in the Victorian wine world and they have a new vineyard in Red Hill which is super exciting for the area. We are going to have all of their new release wines over dinner and as they have vineyard sites also in the Yarra and Gippsland it will be a real treat to taste them all. I personally think that their Chardonnay is the best Mornington Chardonnay that I have tried since I moved down here to open the restaurant five years ago, and I have tried a huge number of wines in that time. 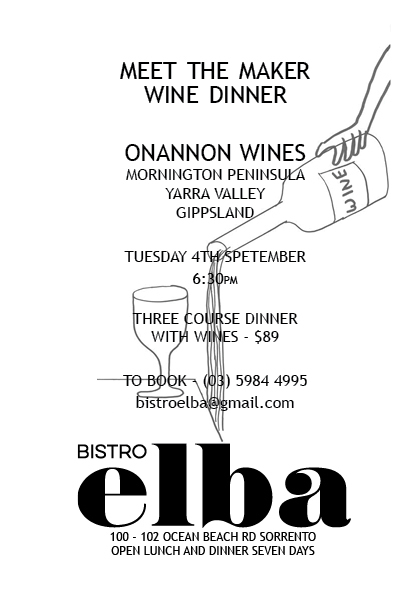 We are going to run the dinner over three courses with several wines to accompany each of the dishes. The ladies who own the Independent Wine store in Rye are going to be in attendance and will have some great discounts available to our guests if they wish to purchase any of the wines on the night. We love teaming up with them as it is a great way to add a little more value to the evening for everyone coming as the wines are made in such small amounts they are not generally available in retail stores and this way you can add them to your cellar at a great price. One of the regular guests told me the other day that what she really enjoys about the wine dinners is that as she has just moved down here permanently she thinks that it is a great way to meet interesting people in a fun environment and has been telling people that they should come along. I would like to say that this is exactly the way we view the evenings as well. So call us to make a booking weather there is one, two or ten of you we would love to have you attend. I have attached a link to a web page about Onannon Wines for those of you who are interested in finding out more about where the boys have worked and are making wine. I will email a finalised menu with the wine matches next week for those of you who love to know everything that we have planned.